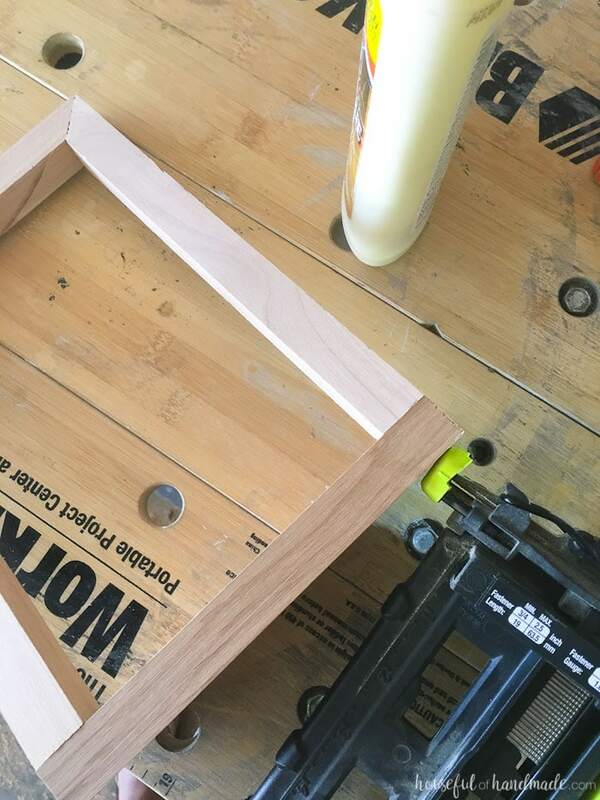 Even thought the temperatures have been close to or in the 100s, I have still been itching to make some easy woodworking projects. I love building more elaborate things like our coffee station and rustic railings, but I also love a project that I can finish in an hour. 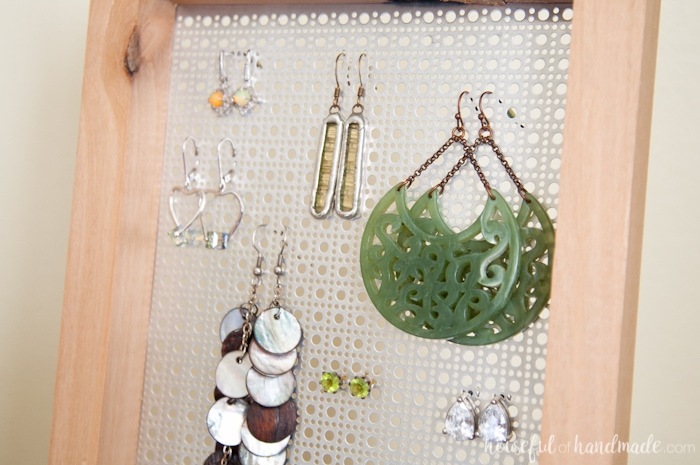 This easy DIY earring stand was the perfect project for a hot afternoon because I was only outside for about 30 minutes! 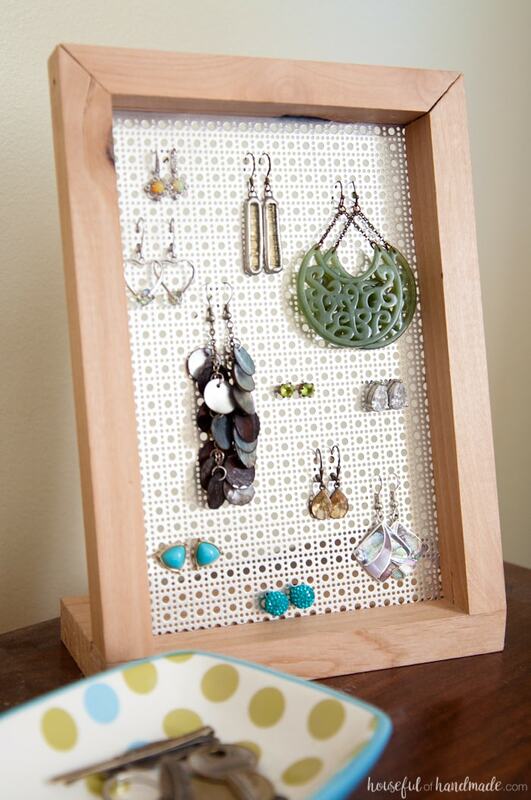 I have been meaning to make an earring holder for a while now. Sadly, I have been storing my earrings in a small box in my dresser drawer. I made a beautiful wall hanging to hold my bracelets and necklaces, but I don’t wear earrings as much anymore since I got out of the habit 4 years ago when my daughter was a baby and would always grab them. But now I want a way to display the few earrings I still have so I can start wearing them again. 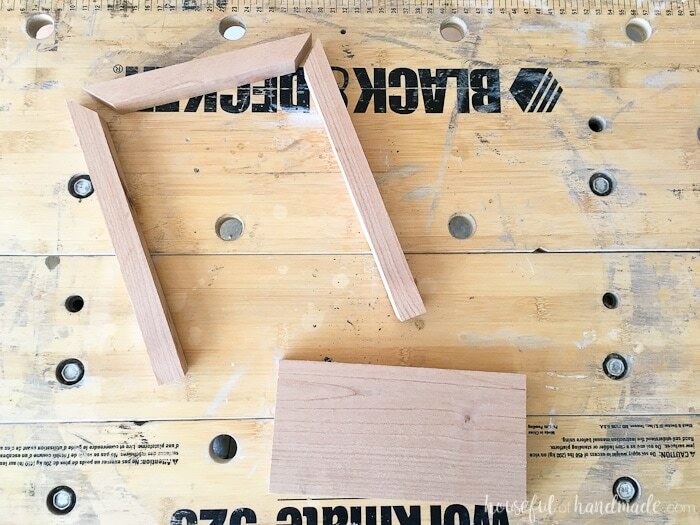 I went for a simple and easy to build DIY earring stand to display my earrings. I didn’t want something too big on my dresser (I really hate clutter and things to dust around). 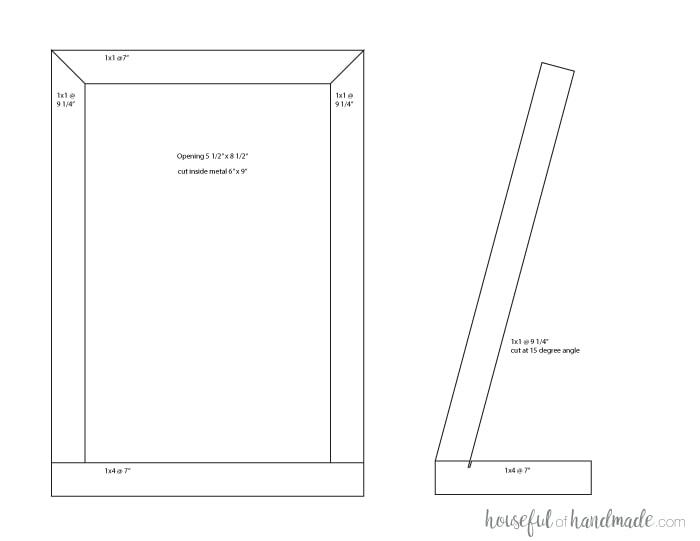 And this design is so simple, you can easily build it without power tools in case you don’t have them (or don’t like to use them). I loved it so much I build one for my daughter too! 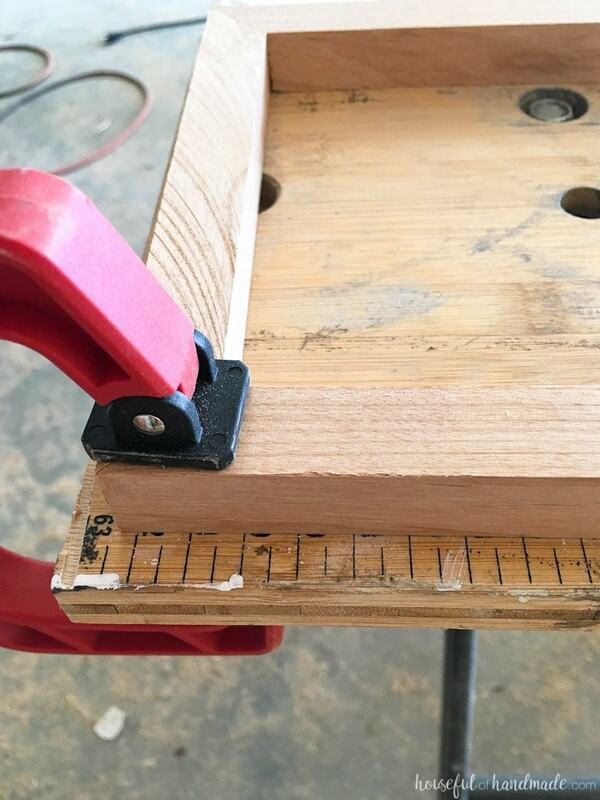 Now your frame is all done. Yeah! Time to give it a quick sanding and then decide on your finish. 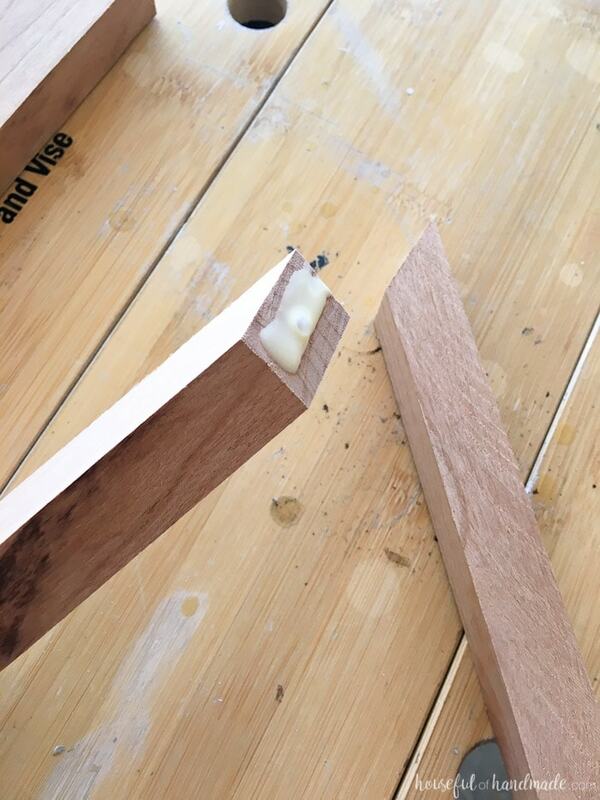 For my stand I left the wood raw and just used a wax to seal it. 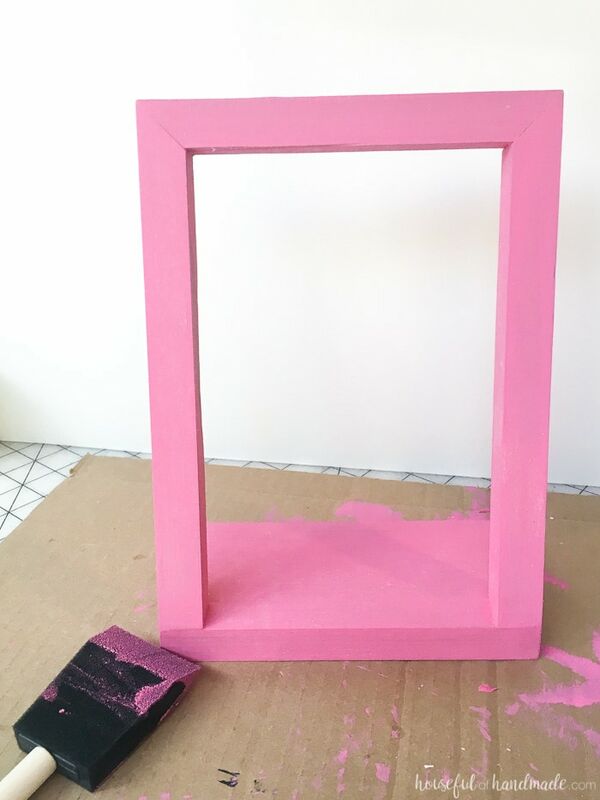 For my daughters, I used a little bit of craft paint and painted it bright pink. She is a huge fan of pink. If I ever want her to like something, just make sure it’s pink and she will love it! After the paint dried I put little bit of furniture wax on it to seal it good too. It has to withstand my rambunctious daughter so a good seal is a necessity. Now all we needed to do was load them up with earrings. I love that the little holes work beautifully for small stud earrings. 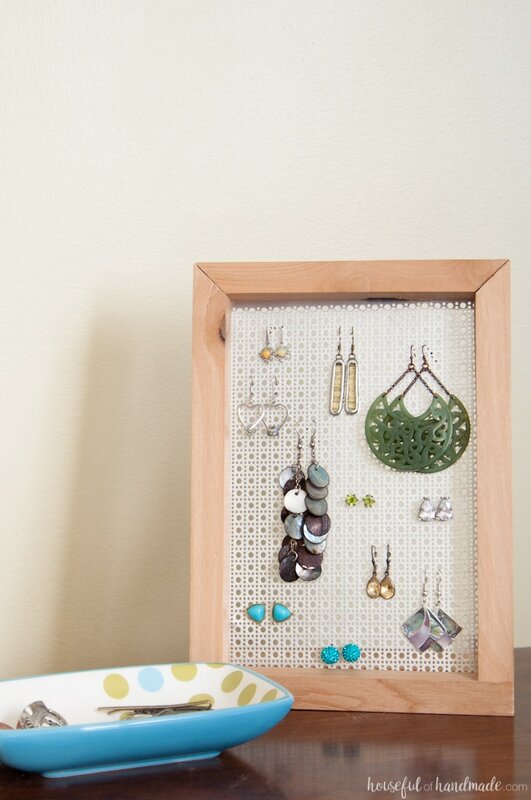 You can easily add the back to the earring to keep it on the DIY jewelry display. 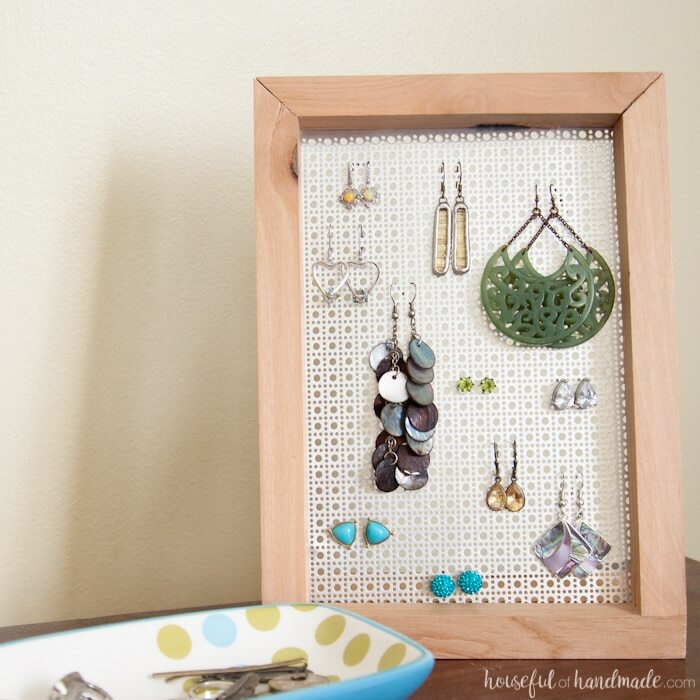 But it also works for larger, dangly earrings because you can easily hang them from the holes too. This post was originally shared at Oh My! Creative. Hope you are staying cool this summer too! 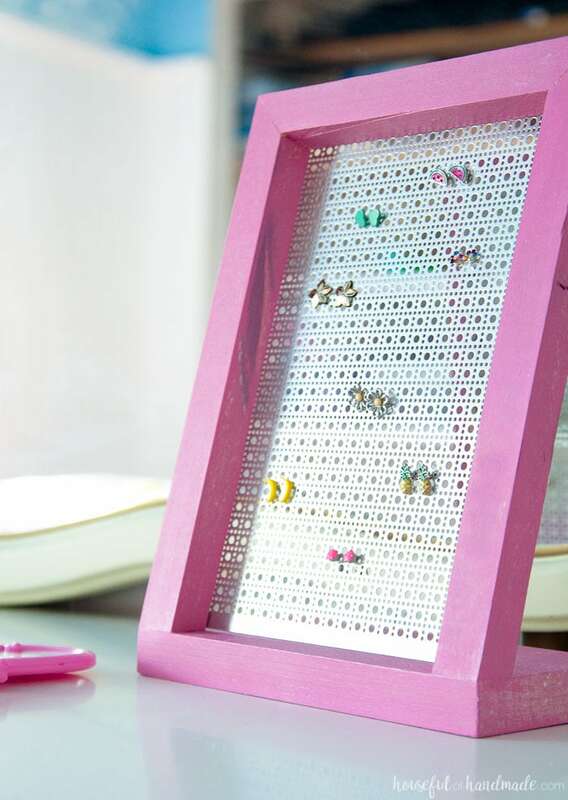 The earrings display looks simple but it’s enough to show off the beauty of the earrings. I have all of such materials, maybe I’ll try to make one as a gift to my friend. Thank for your sharing. Thanks Jacek! 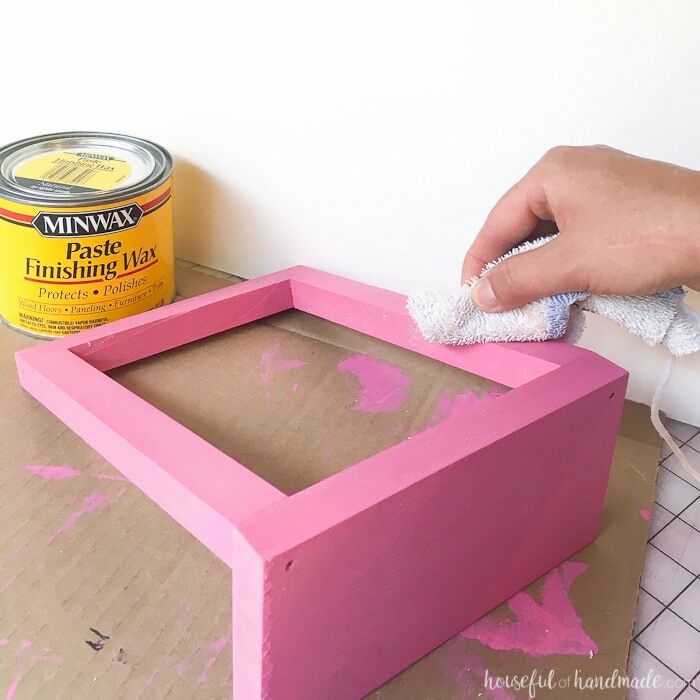 It’s also an easy project to make so perfect for a gift. I hope they enjoy it. Such a cute project! I love all of your earrings too! They are so pretty! Thank you for sharing at Dream. Create. Inspire. Link. Pinning! 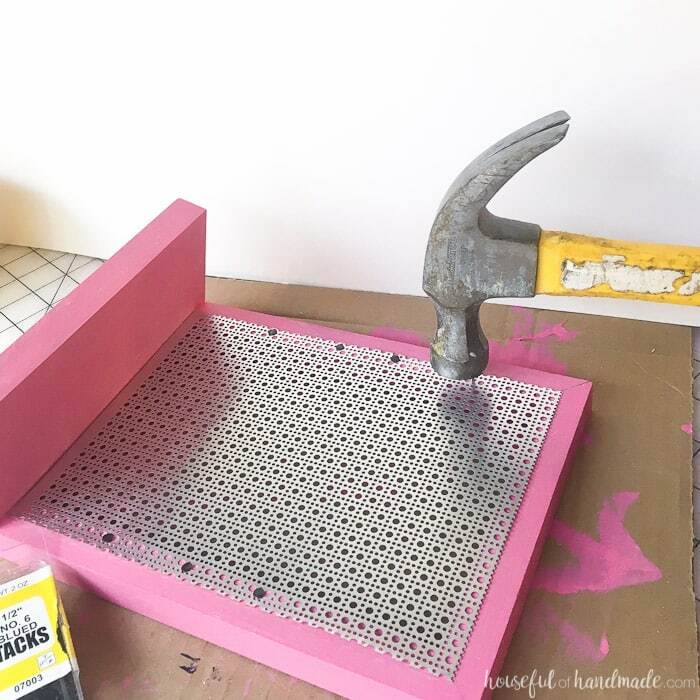 Love this and adding to the list of projects I am going to tackle once the kids are back in school. 2 weeks and 3 days, but who’s counting? Not counting here either 😉 I have huge lists for when I have my free time again! Very nice and functional project. Thanks for sharing with us at Merry Monday.